After scoring both fame and accolades for his iPhone-shot cult movie Tangerine, the tale of a trans prostitute hellbent on getting revenge, Sean Baker is back with The Florida Project, a touching portrait of childhood innocence set against the backdrop of America’s failing economy – and once again, everybody’s talking about his film. The story follows toddlers Moonee, Scooty, Dicky and Moonee’s young mother Halley as they try to distract themselves from the humdrum of day-to-day life on the poverty line with pranks, tricks and juvenile hijinks in their candy-floss-coloured long-stay motel (managed by Willem Dafoe) a stone’s throw from Disneyland. It’s laugh out loud funny, foul mouthed and very real. 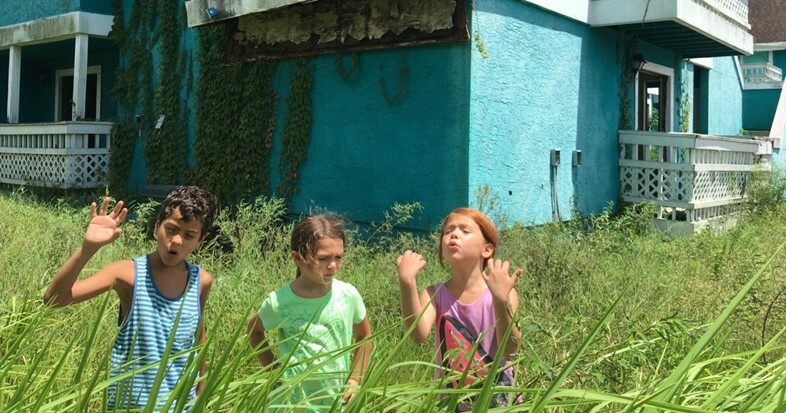 The Florida Project is not only Baker’s best-yet, it’s one of the most compelling films released this year and an Oscar outsider. We caught up with the director to find out more about the film’s social mission, why he feels improv and candid camera are important elements of his movie-making process and why the ending is left so open. Could you explain the film in your own words? Sean Baker: The Florida project is about a rambunctious six year old by the name of Moonee who is living in a budget motel with her single mum, just outside the tourist capital of the world Orlando, Florida. We focus on her comic adventures along with her little group of friends, over the course of one summer as her mother is struggling to keep a roof over her head. The film spotlights America’s ‘hidden homeless.’ What prompted you to explore that topic? Sean Baker: My co-screenwriter sent me articles right at the beginning, but then we got a grant from an organisation called Cinereach and that allowed us to take trips to the Orlando area, and Kissimmee. That’s really where the film’s action takes place. We approached it in a very journalistic way – we interviewed people, anybody that we could, residents of the motels, the small business owners, the motel managers, people from the agency that provide social services to the people in need in the area. The was really how we came up with the action, we knew there was going to be a mother-daughter relationship but that was the extent of it. It wasn’t until we visited these people that we fleshed out Bobby’s character and all the other details of the film. Just being there helped us get to a point where we could write a fictional screenplay. Both Tangerine and The Florida Project give voice to marginalised communities. Do you ever feel trepidation representing those groups? Sean Baker: Of course there is, there always is. We’re from outside of that world so we have to do our due diligence, we have to take the time and make sure our representation is respectful, accurate and responsible. Your films have a strong social message. What drew you to cinema as a means of making that commentary? Sean Baker: Quite honestly, I fell in love with film as an entertainment medium first and foremost. Over the years, as I’ve gotten older, the stories that I want to tell have changed. Growing up, my intention was to go to film school and learn how to make an action film, learn how to make ‘popcorn fare’ as they call it. My focus has changed, I look to the films of Ken Loach and Alan Clarke and others, a lot of British social realists who engage with political issues. Those films truly put a human face on topics that might be considered too heavy handed for entertainment purposes. Those wonderful filmmakers have been able to do it. I’m using them as a guide. Do you think it’s a sad film? Sean Baker: I can’t say that it isn’t sad, but the thing is, we’re used to having defined genres. It can be a comedy or a drama and this is very much a dromedy. It’s presented as a comedy and it has lots of behavioural humour. It’s sad and funny. It’s presenting a very sad circumstance but uses humour to make it digestible. In a lot of ways improv is an important part of that comedic value. Was it something you intentionally included or was it just part of the process working with such young actors? Sean Baker: I always encourage improvisation. I didn’t know how it was going to work with the kids, I just happened to be blessed enough to work with children who were able to do it really well. I’ve been doing this in my films for a while. From very early on I worked on a television comedy show, that cut my teeth with improv. It’s about allowing the dialogue to be a little loose. I’m not precious with our dialogue and the actors don’t have to be either, they can add or put something into their own words. They can move a line here or there. On top of the improv, you cast Halley through Instagram, you filmed some scenes with real hotel guests, candid camera style. Are you including those aspects to make it more real? Are you able to communicate something ‘truer’ that way? Sean Baker: You mean the perfume? Even in the script, it was written that the actors will approach pedestrians and try to sell perfume to them. We knew from the beginning that we would be attempting that and for me, yeah, there is a comfort in having a hybrid. It’s almost half-filmmaking, half-documentary. These are real people, real faces, real reactions and that does give me comfort. In a way it reflects the mission of the film. You’re telling a story, but there’s something very real behind it. Sean Baker: There’s a lot of contrasts in this world. You’re always dealing with two extremes and I guess this is part of that as well. Do you ever think about the character’s lives beyond the timeline of the film? Do you find yourself daydreaming about them? Sean Baker: I do and I don’t. I know that I would never make a sequel or a prequel to any of my films so I don’t entertain it. I’m coming to these characters, knowing that I won’t be presenting the audience with a backstory. I do think about their futures, but the film is presenting a specific moment in time. You want to create empathy with the characters in the present, not having to know anything about them except what you’re presented with in the moment. It’s interesting to see other people do it though, and hear them talk about it, that’s what we want people to do, to talk about the real Moonees out there. We leave it pretty open ended. Sean Baker: To tell you the truth, we edited it so that it’s up in the air. The way we scripted it wasn’t. We cut a scene for timing purposes but then we realised it helps us because it leaves it ambiguous. Did Bobby do it? Did Ashley do it? Was it someone else in the motel? It strengthens the story. There’s a scene where Moonee and her friends are playing in an abandoned house. It looks like it could be an opium den of sorts. That detail, is it a comment on the current opioid crisis in America? Sean Baker: That was something we touched on but didn’t go into detail about. At one point, Route 192 had pill mills up and down it. Overnight the local government made it very difficult to continue that trade – selling just one pill could get you five years. The pharmaceuticals disappeared overnight but the people were left with opioid addictions and turned to heroin. There is a lot of homelessness in the area – hidden homelessness, squats and homeless people living in the woods. We hinted at that for accuracy. The gentleman who shouts “There’s crack and prostitution, burn it down, burn it down,” he was a real resident from one of the motels and we cast him as an extra. Him saying that was him entirely improvised, he brought his own thoughts about the place to that scene. You’re the first person to ask about that. When we were location scouting we went into these abandoned homes and people had obviously been living there, there were makeshift beds.